This kit is the perfect companion for beginning lettering artists! Includes notecards, chalk pencils, mini-chalkboard, and 40 pages of prompts, exercises, and step-by-step projects. 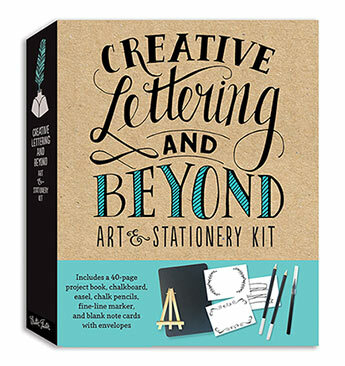 This beautifully packaged, hardcover case is the perfect kit for any aspiring lettering artist! Get a handle on drawing elegant lettering the kit's 40-page project book, notecards, a slate board and easel, and all the implements any lettering artist would need. We have pulled together the artistic talents of several professional hand letterers and calligraphers for a dynamic and interactive experience. They will be your guides as you make your journey through a myriad of projects and prompts. Lettering has been steadily building steam as a new and trendy art form. Even if you're completely new to the discipline, with the provided tips, techniques, and materials, you will be completing project after project. In no time, you'll be experimenting with cursive script, getting your feet wet with calligraphy, and embellishing and illuminating hand-lettered artwork, just to name a few. This all-in-one art guide is perfect for the artist in your life. The highly giftable kit brings everything an artist needs for a weekend of artistic fun, or a new skill for a lifetime. Gabri Kirkendall is a self-taught artist and designer who specializes in pen and ink, watercolor, and photography. She works out of her home studio in Tacoma, Washington, and has a thriving online shop at Etsy. Julie Manwaring has long loved the whimsical, rhythmic beauty found in the repeating letterforms and flourishes of calligraphy. Her custom hand-lettering and illustration studio, Flourish & Whim, grew out of this love for letters and passion for art. Julie's styles are a unique blend of classic and modern - the perfectly imperfect ups and downs, swirls, and undulations create a graceful dance of words. Hailing from the Northeast, To learn more about Julie and her work, visit www.flourishandwhim.com. Shauna Lynn Panczyszyn is a hand-lettering artist and illustrator. She loves to create side projects based around lettering, such as her Three Word Stories project and positive quotes. Shauna works out of her home studio with her puppy, Teddy. Learn more about Shauna by visiting www.shaunaparmesan.com. Laura Lavender has always been passionate about the fabulous world of the arts. Her work has been commissioned by greeting card and book publishers, fashion designers, and musicians and has been featured in many magazines and blogs. Laura lives on Vancouver Island in Canada, where she paints, sews, gardens, dances and sings, and spends time with her family.